Mention or write a constructive article about A' Design Award and Competition at your blog to earn a free Digital Edition enty ticket for you or your friends. 2. Write a constructive article about A' Design Award & Competition and post it at your blog. You could mention: winners, the award, benefits to winners, etc in your blog entry. You could also mention how to improve the award; the overall experience, the service etc, with constructive feedbacks. You can write a disclaimer (or indicate your post as a sponsored post) if you would prefer. 2. Please link to A' Design Award & Competition. 5. Your article must be at least 200 words long. You can publish A' Design Awards' Call for Submissions, Nominations or Partakers, in this post, we would like you to run a post titled "A' Design Award - Call for Participants" or similar. A' Design Award is one of the worlds' most respected design competitions, and we want to share this with your audience. 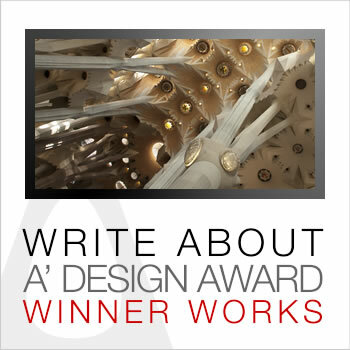 At the beginning of this post, it would be great if you could provide a 2-paragraph description of the A' Design Award in your own words. Please link to https://competition.adesignaward.com , a presentation of A' Design Award and what it means for designers is provided here: http://www.whatisadesignaward.com which could help you summarize the awards. It is always a good idea to feature 1-3 previously awarded designs you like within the call for submissions post, please pick from https://competition.adesignaward.com/winners.php and link to this page as "see previous past design award winners" or similar.